An 8-year-old Nigerian refugee whose family is homeless recently won his category at the New York State chess championship without a single defeat. Rana Novini reports. An 8-year-old Nigerian refugee whose family is homeless recently won first place at the New York State chess championship without a single defeat and he says he is not done yet. “I like deep thinking,” Tanitoluwa Adewumi said. 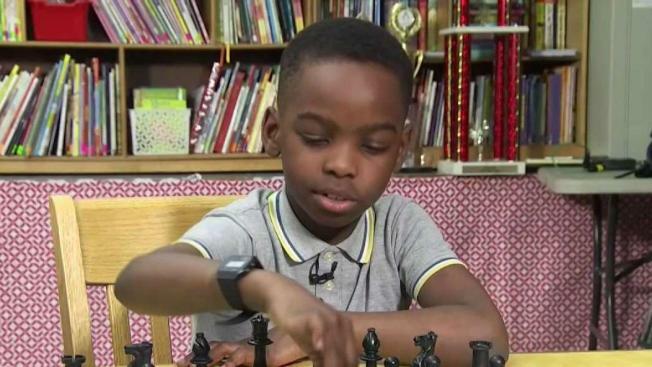 Tanitoluwa is a third-grader who started playing chess a year ago and whose coach at P.S. 116 said practices the board game every single day for hours on his own. Tanitoluwa moved to New York City with his family two years ago as refugees from Nigeria. His parents told NBC's "Today" show they feared attacks by the terror group Boko Haram and are seeking religious asylum. The family has been living in a homeless shelter and his parents say he can only practice the game on the floor. That hasn't stopped Tanitoluwa's unwavering dedication to improving his chess prowess. Last weekend, Tanitoluwa won the New York State Primary Chess tournament for his age group and took home a big trophy to prove it. “His eyes lit up,” Martinez said. After Tanitoluwa's win, Russell Makofsky, who oversees P.S. 116's chess program, launched a GoFundMe page to help the family get out of the shelter. Within days the crowdfunding effort surpassed its goal of raising $50,000 and a donor reached out offering the family an apartment. By Tuesday morning, more than $160,000 had been donated by 2,871 people -- more than tripling the fundraising goal in three days. On Tuesday, Tanitoluwa and his family were set to make an important move, to a new home. Tanitoluwa, meanwhile, is preparing for the national championship in May. “I want to be the youngest grandmaster in the world,” Tanitoluwa said.